Last year I worked on a series of 51 black and white maps for author Judy Bentley's book Hiking Washington's History.I received my copy in the mail today, and it looks great! The published size of the maps is a bit smaller than the versions I produced, so some of the text is a bit difficult to read, but on balance I'm quite happy with the finished product. In a future post, I'll write about the unique challenges associated with black and white cartography. Click on images to embiggen. 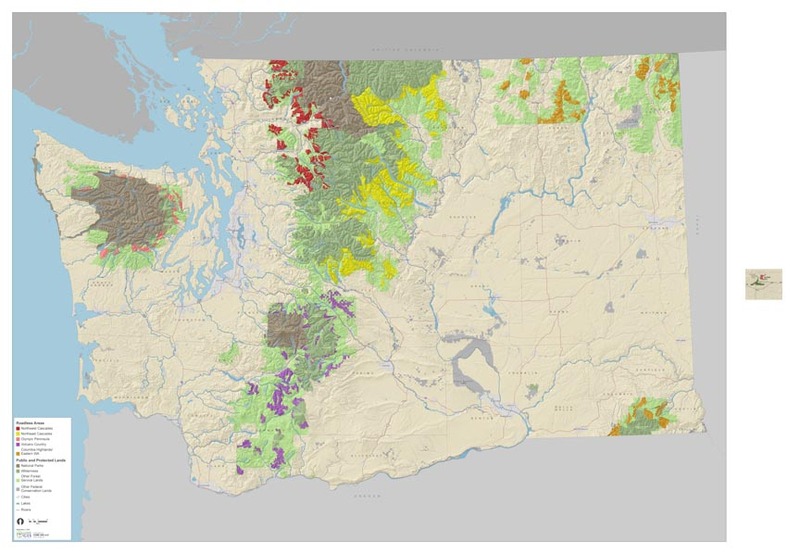 The week before last I worked on two maps for two different non-profit organizations focused on wilderness protection: The Wilderness Society and the Washington Wilderness Coalition. TWS needed a thumbnail of a map for a newsletter; WWC needed a giant backdrop map for a display they are putting together with a graphic designer. As it turns out, the TWS map is the smallest map I have ever made (2.5" x 3") and the WWC map is the largest I have ever made (60" x 45"). Here is an image to give you a sense of the difference. Biggest on left, smallest on right. Click on thumbnail to embiggen. The NY Times published this very intriguing piece about GIS earlier this month. It focuses primarily upon urban design and architectural applications, but it's nice to see the technology getting such prevalent exposure.